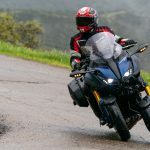 The corner would have been extremely sketchy on your typical motorcycle – though I wouldn’t have been going as fast on one in the wet conditions in which I was riding. 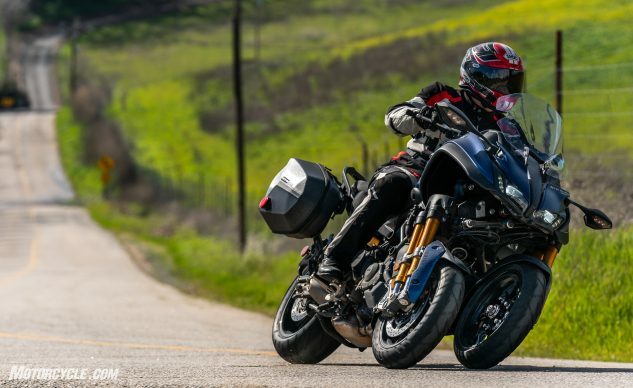 A couple of corners later, as the right front tire spent a little too much time on a tar snake with the bike leaned over, I got to actually feel what it is like when a contact patch does lose traction. The bike tracked like nothing was wrong, betraying the one-wheel slip with a slight oscillation of the handlebar. Essentially, it was a non-event. 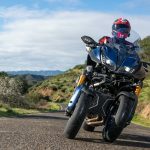 The combination of those two moments on the 2019 Yamaha Niken GT won me over. 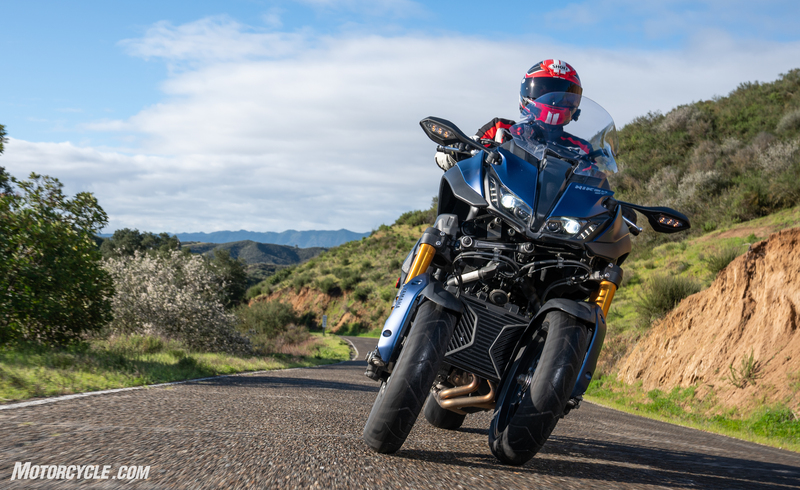 The Niken’s front end is the special sauce that sets it apart from the rest of the motorcycling world. Looking somewhat like a bulldog in its stance, the Niken gets its unique style from the dual 15-inch front wheels and their associated pairs of inverted fork tubes. At first glance, the Niken is weird – with a capital W, according to my wife. 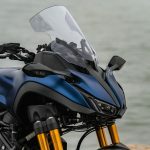 However, that strange appearance and the impressive technology tucked away under the bodywork are all in the service of one primary goal, increased rider confidence. 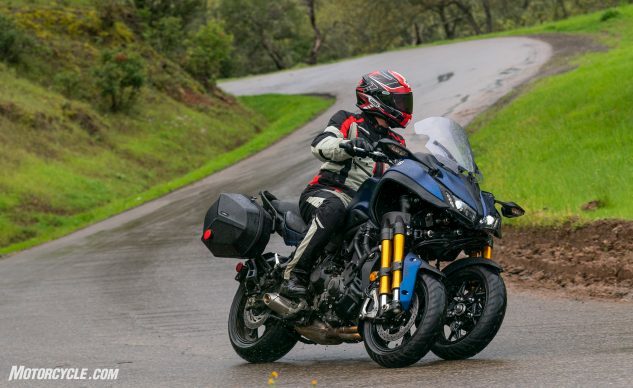 If you’re wondering why Yamaha went with 15-inch front wheels, take a look at this photo. There would be an inch less space between the top of the tire and all that hardware. Also, the increased gyroscopic effect would make the steering heavier. 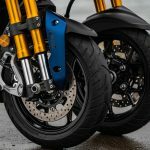 To maintain the steering dynamics and feel of a two-wheeled motorcycle, Yamaha’s Leaning Multi-Wheel System utilizes some pretty cool engineering to simultaneously perform three distinct tasks: leaning, bump absorption, and steering. The two fork tubes that comprise the Kayaba inverted fork mounted to each front axle perform two different jobs. The front, with its 41mm slider, is empty, save for some lubricating fork oil. It is there solely to provide stability and keep its wheel in line. All of the bump absorption happens in the fully-adjustable, 43mm rear slider. However, the parallelogram linkage also plays a role in transpiring some of the load to the fork on the other wheel. Think of it this way: As the left wheel drops into a pothole, the left fork extends, but the whole fork assembly also drops thanks to the parallelogram linkage, extending the fork on the other wheel, too. So, when the far side of the pothole hits the left wheel, some of the force is passed through the parallelogram linkage to the other fork leg’s compression circuit. 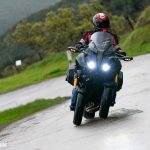 The net result is that, when hitting a bump or pothole on only one front wheel, the shock transferred to the rider is greatly diminished. In fact, when purposely running over Botts’ dots with one wheel on the highway, their effect can barely be felt. The Ackermann steering geometry in action. You can see how the inside wheel is turned slightly more. 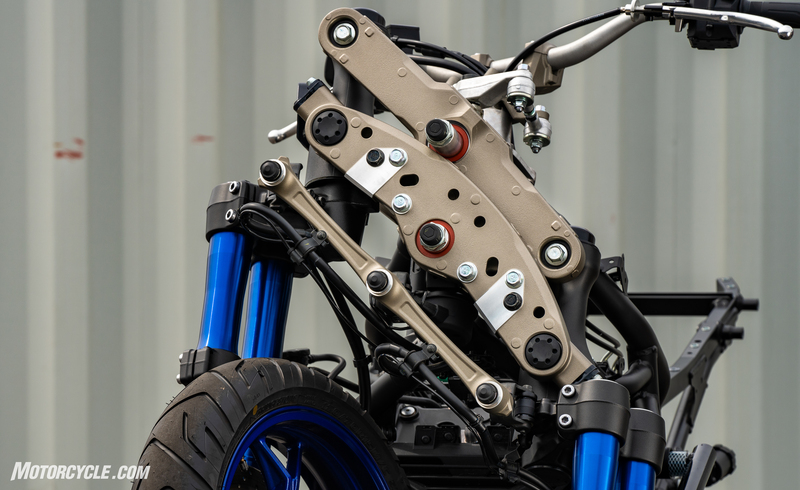 Here you can see the offset of the parallelogram linkage’s steering head and the one for the handlebar. 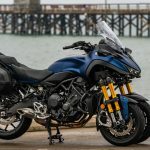 While Yamaha says the Niken GT is based on the Tracer 900, you wouldn’t be able to tell if you only looked at the chassis. Obviously, the front end is different, and the steering head has its own unique requirements. Because of the high level of refinement required from the steering head, it is a steel investment casting. 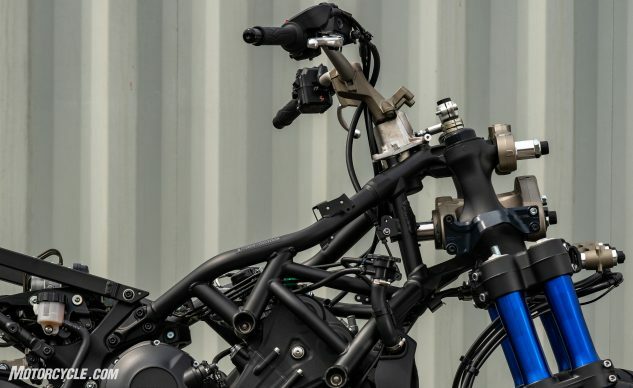 A high-tensile steel tubular frame connects the head to the aluminum swingarm mount. 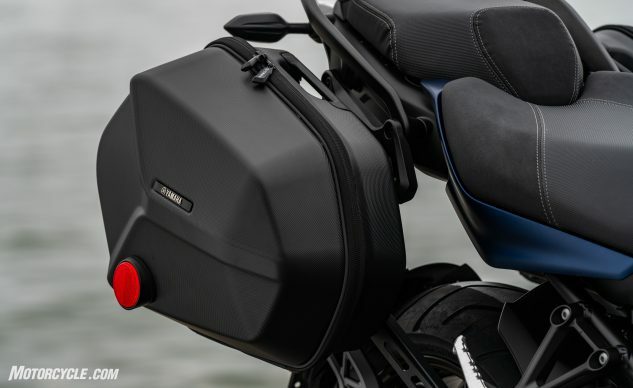 From there, the aluminum subframe supports the rider, passenger, and luggage. Even the Niken’s swingarm differs from the Tracer. For increased stiffness – and to achieve the desired wheelbase with the parallelogram linkage hanging off the front – the aluminum swingarm was shortened by 44mm. 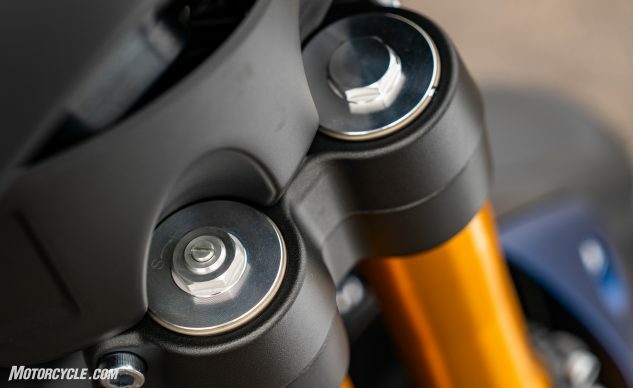 A preload- and rebound-adjustable shock handles the bump absorption and features a convenient remote preload adjuster for fine-tuning the suspension to the cargo load. 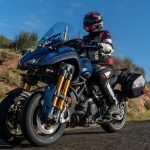 Although the Niken’s engine is mostly unchanged during its switch from the Tracer, all of the key numbers stay the same for the 897-cc Triple. The 78mm x 59.1mm bore and stroke still gets squished to an 11.5:1 compression ratio before things go boom. Then the DOHC heads with their four valves per cylinder exchange the old for the new, and things repeat themselves. I could go all staggered intake funnels and mass-centralized 3-into-1 exhaust on you, but this review is already kinda long. So, I’ll get to what’s changed. 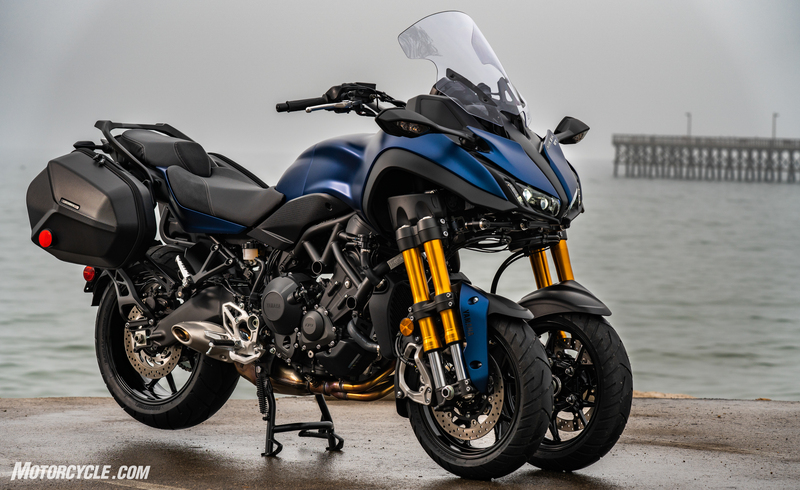 The crankshaft has been beefed up in all the right places to give it 18% more inertial mass compared to the Tracer GT. This doesn’t mean the crank is 18% heavier. Rather, weight has been applied to it so that when it is spinning it carries more inertia for improved drivability. 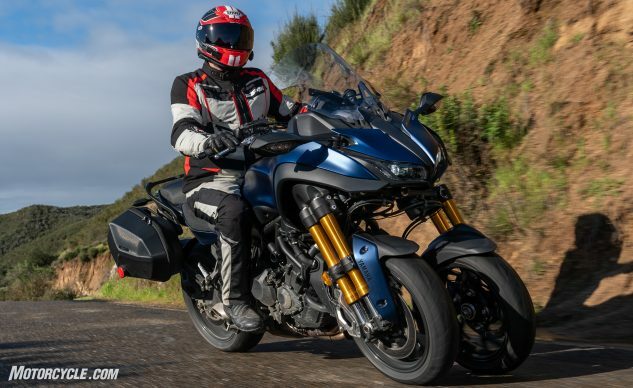 I’ll just interject my opinion right here and say that Yamaha appears to have finally exorcized the snatchiness that previous versions of this engine suffered from. So, thank you, Yamaha engineers, your efforts are appreciated. See, the front fork leg really doesn’t have anything in it! The other notable change with the Niken’s engine is the beefed-up transmission. While it retains the same internal ratios as the Tracer, the material that the cogs are constructed from is stronger. Since the only other choice was to increase the size of the transmission itself and thereby make the engine wider, people who are shorter in inseam will appreciate that the reach to the ground from the 32.9-inch seat was kept as narrow as it is. The chain final drive was bumped up two teeth on the rear sprocket to give more spritely acceleration. 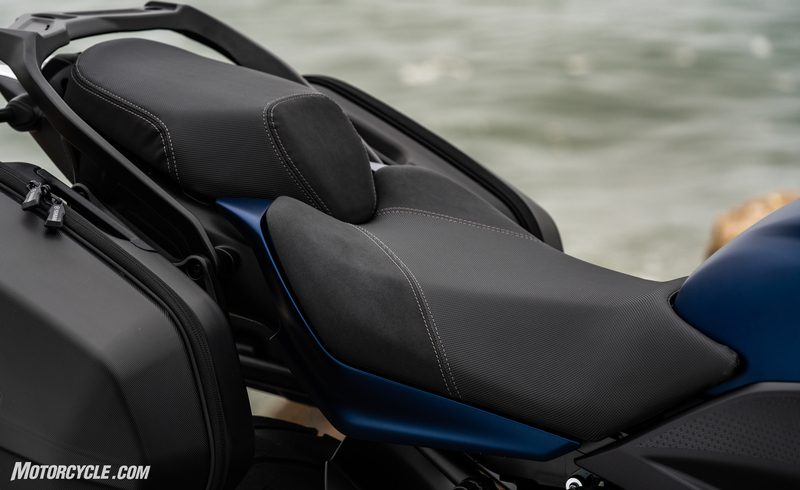 With a riding position that is designed to be all-day comfortable, the Niken coddles the rider and passenger with a plush, wide seat that rivals that of many big touring rigs. The GT, when compared to the regular Niken, receives a taller windscreen that directed the airflow over my 5-foot 11-inch frame. 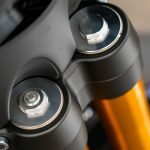 The protection appears to be the right compromise between cooling wind and relatively still air that makes the bike appropriate for all-season riding. The big disappointment with the windshield is that it is non-adjustable. 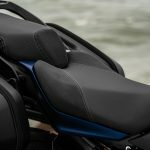 So, if you want more wind protection, you’ll need to order Yamaha’s accessory item. The windshield is taller but non-adjustable. 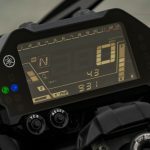 The LCD instrument cluster is well laid out and easy to read. The electronics package is limited by current standards, but it hits all the right notes. The engine has three ride modes, named 1, 2, and 3, with 1 giving the sportiest ride and 3 being a rain mode. I found myself staying in 1 for any riding that involved curves and in 2 for around town. During the rain, I experimented with 2 and 3. Traction control has two similarly named settings, and during the rain, I stayed in 2 and could see the little flashing light telling me that the ECU was doing its job as I exited corners. 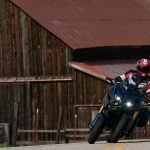 The included cruise control and heated grips were appreciated on this sport-touring rig. Some of the journalists noted that the right grip got considerably warmer than the left, but fortunately, my Niken didn’t suffer from this. That seat is pretty dang comfortable. I know some people will whine about the lack of a TFT display, but the LCD is fine. Really. It’s well laid out and has all of the information easily accessible via the left switch cluster. A TFT would’ve only added bells and whistles. The ABS is another story. Yes, each wheel gets its own dedicated ABS circuit, meaning you can trigger the ABS in one front wheel but not the other in slick stuff. However, in this day of IMUs that offer predictive ABS and TC, I couldn’t help but feel that cornering ABS would’ve been nice to have when we were riding in the wet. 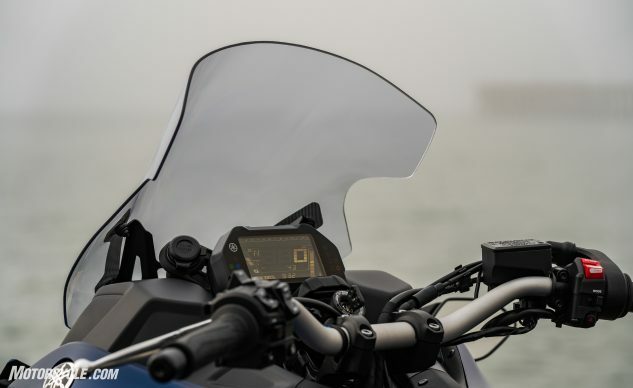 Almost as if Yamaha had paid for inclement weather, it began to rain the night before the ride and carried on throughout most of the first day of riding. We were going to get to thoroughly test the front end in less than ideal riding conditions. And I’ve got to admit that after a few tentative cornering exercises, the pace kept increasing in the wet all day. 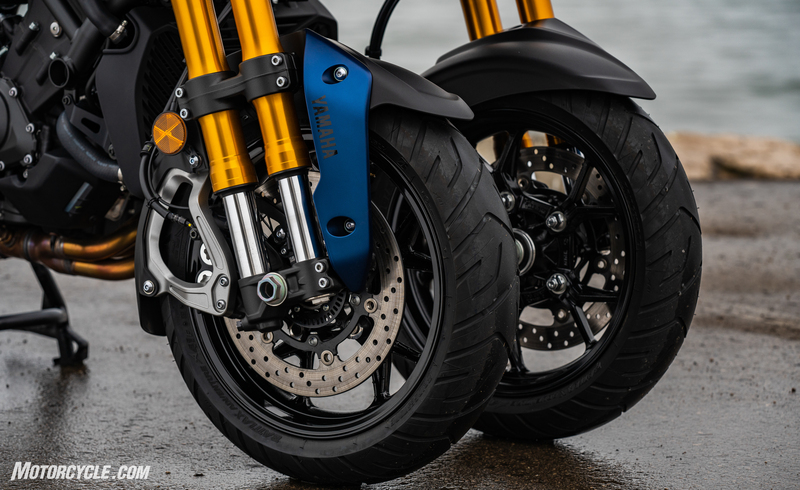 The Niken steers just like a regular motorcycle. As the MSF Basic Rider’s Course said all those years ago, you push right to go right. Steering at low speed feels exactly the same. Basically, after a few miles, I stopped worrying about how different the front end was and started focusing on what it could do differently. True to Yamaha’s press briefing, I had more confidence cornering in the wet. I didn’t worry too much if I saw a little sand on part of the road in the dry, either. Knowing that I had an extra front wheel to take up the slack should one slip made me smile as we cruised through wet corners. 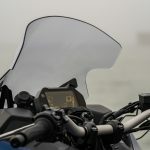 One tester even managed to hit wet leaves in a section of road, and he said the bike slid just like a car until it regained traction, leaving him unconcerned about falling down and able to adapt more easily to the new path of travel. The radial-mount 4-piston calipers squeeze 298mm discs. They offer plenty of power with a good squeeze, but more initial bite would be appreciated. All that front end trickery does come at a cost. First, it’s heavier. Since there are no weight figures in my press kit, I’ll just stick with Burns’ statement of 150 lb. from his Niken intro. The second cost is that the front end feel is extremely numb. Hitting a road irregularity with one wheel resulted in very little feedback at the grips. Hitting one with both wheels at the same time came closer to the feeling of riding a traditional motorcycle but still somewhat muted. Although this lack of feel requires some getting used to, I didn’t find it unsettling after spending more time on the Niken. After all, I have increased cornering grip in the front from those two contact patches, and my experience of momentary slips left me confident in the Niken’s abilities. However, as I said in my introduction, the Niken’s front end isn’t a magic bullet. I’m sure that, if I set my MOronic mind to it, I could find a way to lose the front end and crash. Cars certainly seem capable of crashing in bad weather. But what about sport-riding? 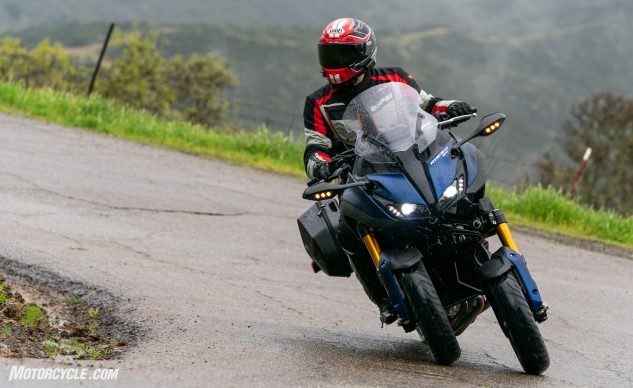 Yes, the Niken does require more effort to turn in and transition from side-to-side, but it has a nice wide handlebar offering the necessary leverage to get the bike cranked over in a hurry. So, you can get your peg-grinding ya-yas out if you so desire (Also, for those that are wondering, the Niken GT is only 35mm wider than the Tracer GT, and that comes at the grips.) 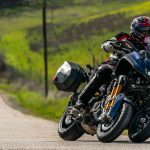 Yamaha says you’ll be hard-pressed to reach the front end’s lean lock because hard parts start dragging before you reach the 45° limit. 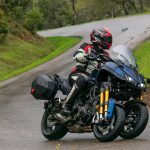 The 2019 Niken GT package includes: comfort rider/passenger seat, taller windscreen, heated grips, centerstand, passenger grab rail with ability to mount (locking) accessory top case, quick release “lockable” saddlebags, and an additional 12V power outlet. 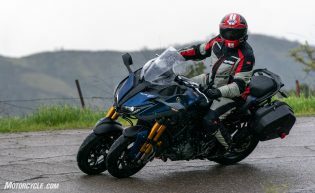 Moving beyond sporting and touring duties, the Niken GT works great as a daily rider. 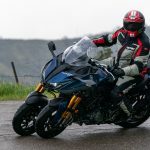 In fact, I think that one of the rider types that will benefit most from what the Niken offers is the year ‘round rider in parts of the country where rain is a fairly common occurrence. Wet manhole covers are instantly less dangerous – as are the metal plates used in construction zones. The only drawback with the GT for urban use is that its saddlebags are semi-hard zippered items. What a huge bummer! In order to keep the bag contents dry, you need to put them in the included dry bags. 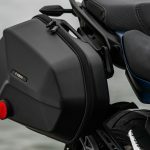 Also, Yamaha tries to claim that they are locking by including a little combination lock to hook through the zipper pulls. A bad guy with a sharp knife and a little time can easily get to anything inside the bags. 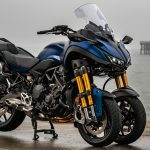 The saddlebags are the biggest letdown about the Niken GT, but they do look nice. That said, the Niken GT is a great daily mount. Californians (and now Utahns!) will love that it is still narrow enough to split lanes in traffic. Travelers will enjoy the way the front end makes the bike float over freeway expansion joints. 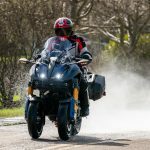 Sport-tourers will be confident when riding on unfamiliar wet roads. The bike is simply quite fun to ride. The 2019 Niken GT is trickling into showrooms now and is available in Matte Phantom Blue for $17,299. 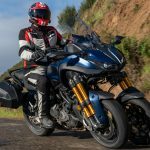 If you’re interested in a Niken, the GT is your only option for the remainder of the 2019 model year. The standard Niken is sold out. So, go find a test ride to see what I’ve been yammering on about. I think you’ll like it – funny looks from passersby and all.